People, we can not let Nicko lose this vote! Loudwire are crowning the greatest metal drummer of all time. Nicko McBrain has reached the semi-finals, where he is currently taking a beating from Vinnie Paul. 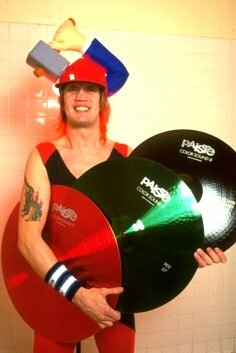 We all know that Nicko is the greatest metal drummer ever! So head on over to give your votes and make sure that old flat-nose makes it to the final, and hopefully to NUMBER ONE! Up the Irons! Up McBrain! The 23,000 seater is brand new, now the largest venue in Austin, so Maiden was the first headliner to break it in. There were some visual technical difficulties and some minor snags (such as Adrian getting his guitar caught on one of the side curtains), but everyone being the consummate professionals they are, still exuded incredible energy in all its highest glory. The sound was soul-stealing!! Standing on the naked earth in the GA section, the drums literally shook your sternum. The guitars were crisp, Harry was very well audible and pounding throughout, and Bruce’s vocals were ON. Everyone was. Regardless of whatever set-backs they may have been experiencing backstage, they hit every note in perfect sync in grand fashion. The set list, though a little deviated from their standards was still very powerful and well arranged. Many of us were a little heart heavy at the thought of missing “Hallowed” and “Rime of the Ancient Mariner” but were still emotionally moved and spellbound through “Seventh Son” and “The Prophecy.” There was less playfulness and “Brucification” with the audience, but much more drama and a lot more music making it probably what I would lovingly consider their most captivating show. Many people are reporting that the sound issue seems to be fixed. Shame they left it for more than a year, but better late than never!